CGI certainly produces the peak of reality while Ray's stopmotion reproduces art in all its expression. Both have value in telling the story to be told....BUT Ray's work remains memorable while the CGI just flashes by. I may have misunderstood your meaning, but it seems to indicate a fundamental difference in our understanding of CGI. 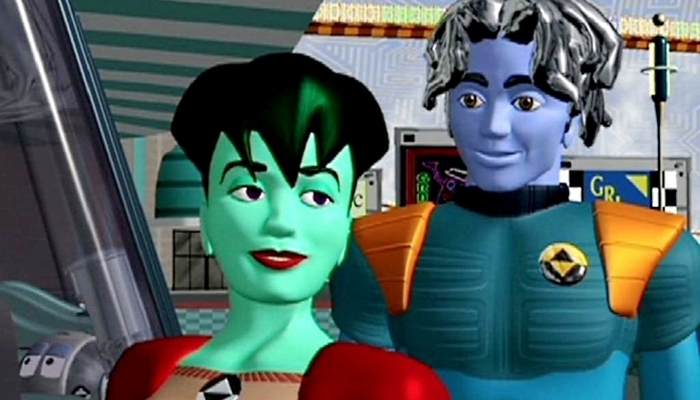 In the early days of CGI when it was only capable of creating a very stylized version of what it portrayed, I enjoyed this new art form very much in shows like Reboot. Toy Story and all the other Pixar productions still make brilliant use of that stylized art form. The CGI is used as a new kind of pen-and-ink, an advanced form of brush-and-paint. Those fine movies are cartoons in the grand tradition of Snow White and The Little Mermaid. 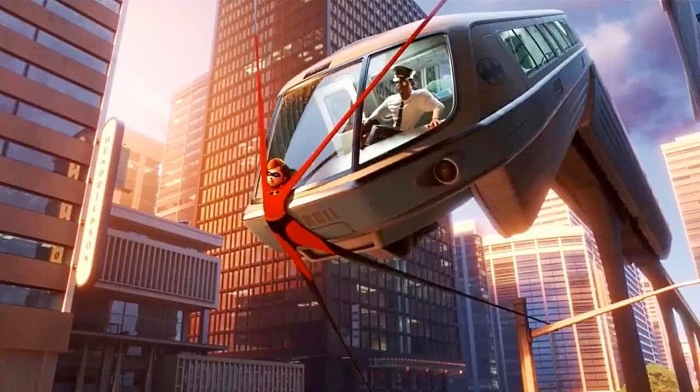 One of the things I was impressed by when I saw The Incredibles 1 and 2 was the beautiful futuristic designs. I love the look of Mr. Incredible's car, Elastigirl's motorcycle, the new house they lived in, the mag-lift train, and that amazing hydrofoil with its Seaview windows that rise up out of the water when it hits top speed! — this photograph of a beautiful 1960 Chevy Impala . . . is NOT a photograph. 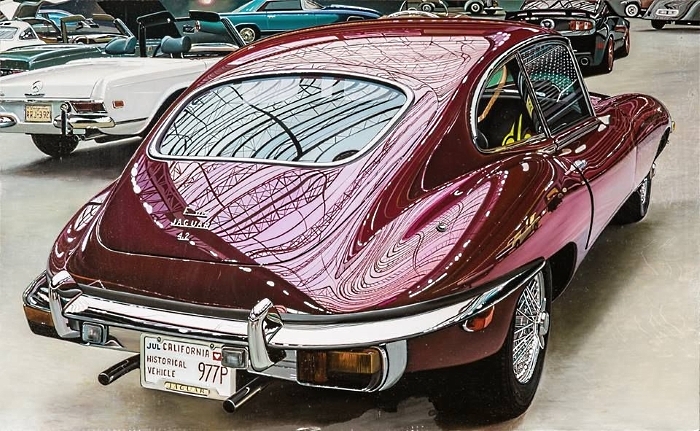 It's a fine example of "photo realistic art", a special art form that strives to look as much like a photo as possible. Gord, all I'm saying is that CGI can be "stylized" or it can be "photo realistic", but either way I feel that it's done by people who qualify as artists, because they have to deal with all the elements an artists does: light sources, textures, colors, composition, perspective, etc. Think of it this way. In Mary Poppins we see stunning matte paintings of the London skyline which were rendered by Peter Ellenshaw. Such matte paintings were once common in movies, and I love 'em! ~ Click on the image to see a 1,200 pixel version. In some of the classic movies these matte paintings comprise the upper half of a shot (such as the parts of a large set that needed an elaborate ceiling), and they're so realistic we can't tell where the set ends and the painting begins! 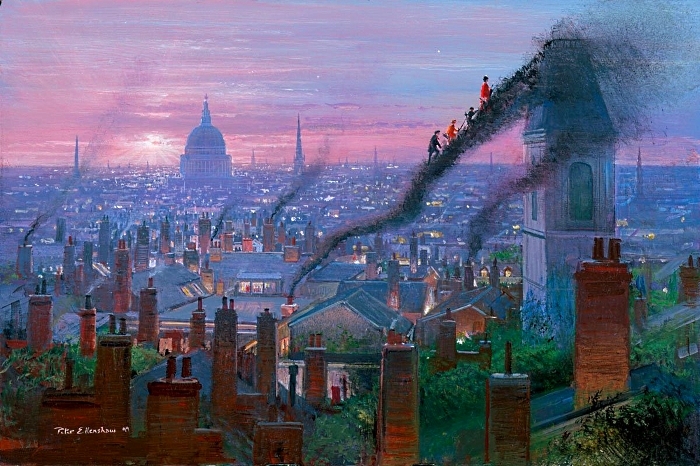 In those cases, the artist wasn't trying to dazzle use with his unique style, he was trying to imitate reality as closely as possible. Today such images are done with CGI, and they look so convincing we don't even know they aren't real. The fact that we're fooled by the amazing realism is proof that talented artists have done their jobs well — just like the matte artists who convinced us that the upper half of the shot is as real as the lower half. CGI is just another way to create artwork. And since it requires a high degree of artistic talent to be used effectively, I consider the results to be artwork. Harryhausen's work is analogous to the kind of CGI which is deliberately stylized, not deliberately realistic. If you're a fan of stop motion you accept (and even enjoy) the non-realistic way the animation portrays the motion of the models. It's true that Ray's work is pure art and extremely memorable, because it never tries to be realistic. Likewise, CGI can be just as "unrealistic" the way it is in the Pixar movies. However, regardless of whether the artists is trying to produce results that are realistic or stylized, it's still artwork. For that reason I would respectfully disagree with this statement. I think you have to differentiate Ray's work from CGI as the difference between ART and workmenship. I suspect you didn't mean that ALL computer generated images are merely the product of "workmanship". And I would certainly agree that not all CGI demonstrates the same level of artistic excellence that movies like the Pixar films do. But the difference between artist efforts and "workmanship" might be defined this way: Even an unskilled artist who paints a really bad wall mural is still an artist. On the other hand, even the most skilled house painter . . . is a workman. — this photograph of a beautiful 1958 Chevy Impala . . . is NOT a photograph. It's a 1960 Chevy, actually. Thanks. I fixed the error. I think a little different from you on the "photo realism" issue. It certainly can be considered "art"....as can mechanical drawings and blueprints be considered "art". It requires talent and training and dedication to the medium and can show great individualism (Like the works of Probert and Cobb and Giger!). But on the whole the results are more realistic than stylelized. Take your own works as an example. Your portraits, paintings and drawings are wonderful but couldn't be confused with a photograph. They show your "artistic" style and that's what makes them unique and enjoyable to the viewer. They surpass mere workmanship and reflect your individual style. That's what makes the works of Ray Harryhausen so special. They transcend realism and reflect "art"
Movies like THE INCREDIBLES are marvelous and on the whole reflect the artists' style. I'm also in agreement that CGI in action movies like THE AVENGERS et. al . is necessary to portray the impossible! They are beautifully expressed and vital to the storytelling but sometimes they are overpowering (Like in THE TRANSFORMERS movies!). Both techniques have value and can be effective, but we can't forget about the charm and uniqueness of the Masters of Stopmotion. We've definitely reached a meeting of the minds, old friend. As you stated, I like art that isn't an attempt to make a "painted photograph" — in other words, the kind where you can see blogs of paint and visible brush strokes, and some of the colors are chosen from the artist's imagination, not just from the subject. 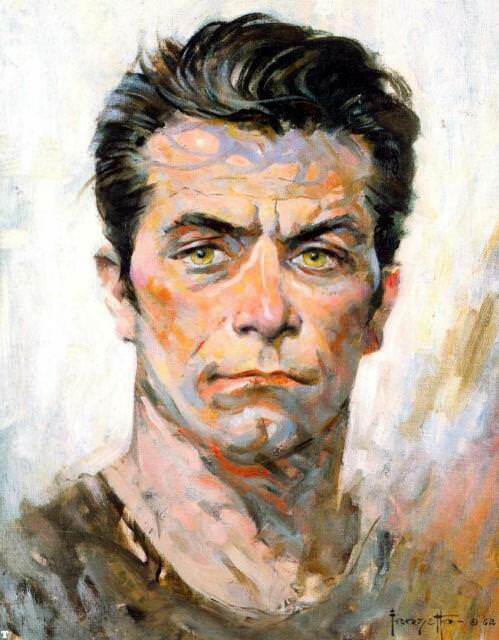 A prime example of this is Frank Frazetta's self portrait, which goes much further to be "stylized" than most of his illustrations. 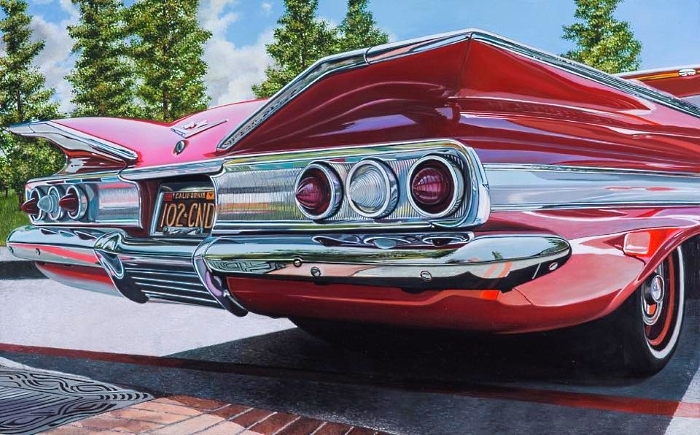 In defense photo realistic artwork, most of them deliberate pick subjects that challenge to the artist to capture the intricate interplay or light, shadow, and reflection, thus making a painting that seems even better a photograph. 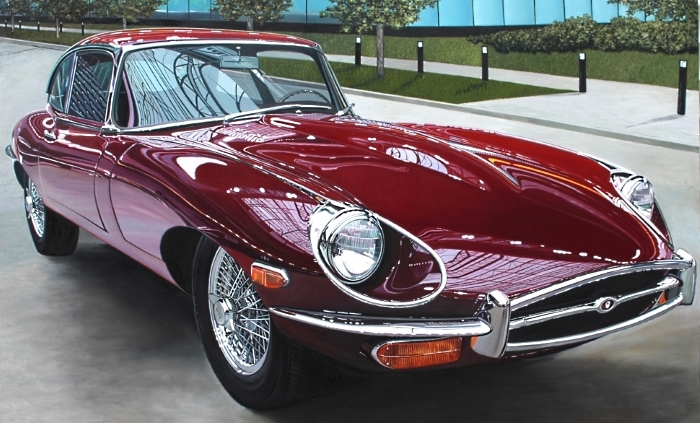 It's a subtle kind of "stylization" in that you'd never see (for example) a red Jaguar like the one shown in these two by photo-realist Cheryl Kelley. The beautiful profusion and complexity of all those reflections actually surpass reality. The website these images came from said the paintings were done in oil on aluminum panel and they measure 22" X 30"
The viewer finds himself mesmerized as he studies it minutely for the same reason our eyes pour over every inch of Frazetta's self portrait, marveling at the hundreds of small decisions the artist made to place every color and brushstroke in just the right place! 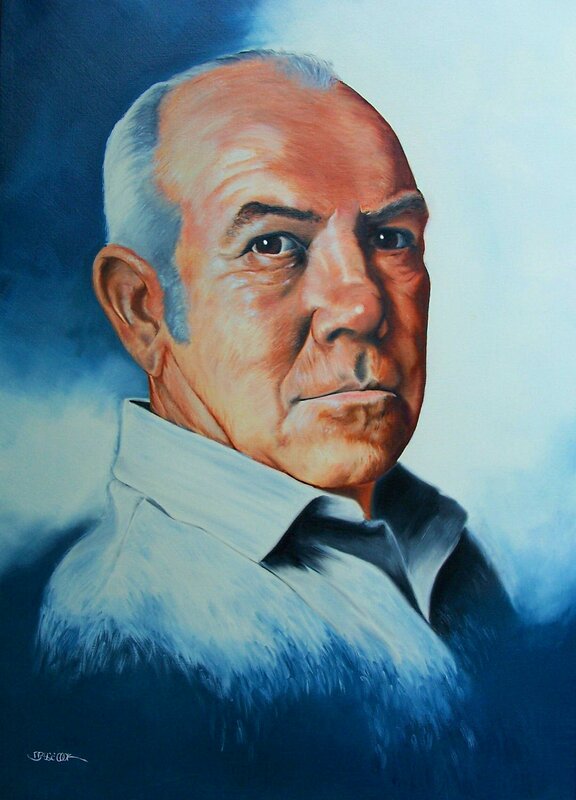 You mentioned my artwork, so I made this close-up cropped section of my father's portrait to demonstrate the stylization you so kindly complimented me on. Good Gawd A'migthy, look all them zillions of little brush strokes! I'm lucky I didn't go blind! Click on the image to see the whole portrait so can count the brush strokes to see if there's really zillions or if I was just lying.